"THE MOST IMPORTANT THING ABOUT THE TEST IS NOT TO GET FRUSTRATED WITH THE RIDICULOUSNESS OF THE TEST. THERE IS NOTHING PRACTICAL ABOUT THE 'PRACTICAL TEST'"
"THE TIME I PASSED, I WAS THE ONLY ONE TAKING THE TEST. NO ONE WAS AHEAD OF ME OR BEHIND ME. I HAD ONE STAFF MEMBER PERSONALLY PROCESSING MY LICENSE. STILL, FROM START TO FINISH, I WAS THERE TWO HOURS." Do I need a reservation for the practical test? Almost always. If you get lucky, there may be a slot open to take the practical test on the same day you take your written test, but not every prefecture will allow that. Prepare to have to make a reservation. Can I make the reservation for whenever I want? Usually yes. Some prefectures assign you a time, but most will let you choose. Keep in mind that the next open time might not be for a week, two weeks, three weeks, or even a month! Summers are especially busy. The reservations will almost always be on work days during business hours either in the morning session or the afternoon session. You will have to take a day (or at least a morning or afternoon depending on how far away you live) off work. Do I have to take nenkyuu (paid yearly leave) to take my driver's exam? It depends on your contracting organization. Many will let you take a special day of leave without having to take a paid holiday. If you have to drive to get to your places of work then you have a good argument. Ask for it. If you fail more than 4 to 6 times, however, even a nice contracting organization might not be willing to give you any more special days of leave. Do NOT wear sandals or any shoes where your toes are exposed. Do not wear heels. People have also been turned away for wearing a skirt or clothing that is very loose or hanging (though some people recommend wearing a short skirt). Wear practical, non-restrictive clothing. Dressing nice doesn't hurt. Can I drive to the Driver's Center to take my practical test? Sure, as long as your International Driver's Permit is still valid. Otherwise, take the bus or train, just in case they are watching you. There are usually a lot of buses and trains that go to the driver's center for obvious reasons. What if I don't know any Japanese? Although it helps put the proctor at ease, knowing Japanese is not necessary. If you know the course well, then you don't need to understand his instructions (though it might be unnerving to hear him give an instruction and not know for sure what he is saying). A simple 'hai' might do after he issues an instruction. At the end, he may explain to you what you did wrong. He will draw a diagram if necessary, but the more Japanese you have, the better you will understand why you failed so you can avoid it next time. If you can, bring a friend to translate. Although the friend cannot be with you in the car during the test, he or she can translate his remarks afterwards. A decent grasp of beginner Japanese and knowledge of a few key terms will help you understand if you cannot bring a Japanese speaker with you. See the chapter on "Handy Japanese" in this book. Bring no less than 5,500 yen. You may not need it all. The fee for processing is 2,400 yen every time you take the test and the license fee if you pass is 1,750 yen. Both are usually paid at a separate window, where you will receive stamps as proof of payment. Often, you will have to pay for the rental of the prefecture's car to take the test. That's 1,100 yen and you may have to use a ticket machine. If you are getting a motorcycle license, etc, in addition, it will be another 3,300 yen. Know the Course. If it's the same course every time, try to get a course map from your predecessor, a fellow JET, your supervisor, or a driving school. Be able to drive the course in your head without looking at the map. If you are unable to get the map ahead of time, or if the course changes every time, you will receive the proper course at the center. Give yourself time to walk the course. Most centers will have an hour preceding the morning test block (usually 8-9) and an hour preceding the afternoon testing block (usually 12-1) when the course is closed to cars and open to people. Walk it. Not only does it get the blood moving, it dramatically reduces the chances of ambiguity. Things that are obvious on the map might not be so clear on the course, but you may see things on the course that aren't specifically outlined on the map, either. Walking the course leisurely takes about 25 to 30 minutes. You'll usually see a few other people doing the same thing. Ask if you're not sure if it is okay. Exaggerate. Everything you do in this test (from checking over your shoulder to untwisting your seatbelt to hitting the brakes) should be done in a slow, obvious, or exaggerated manner. Make it clear that you are looking around a lot and checking your mirrors often. Be Polite and Japanese. Try to use as much Japanese as you can to make the proctor feel comfortable. Even simply saying "hai" after a command will help. Saying "arigatou gozaimasu" afterwards is a good idea too. Questioning the proctor too much (beyond what you need to understand) might not be wise. Getting angry or defensive will not help. You are more likely to pass if you are polite and look remorseful about your errors. Verbalize actions. In some prefectures (like Ehime) the proctors like to hear what you are doing and, in general, verbalizing actions is a good way to avoid ambiguity later. If you do not know a lot of Japanese, saying yoshi ("all right; OK") every time you check your mirrors is one way to be sure the proctor knows that you checked. Saying what you are doing is not always necessary, but it is never a bad idea if you are able to. Don't be in a hurry. The course is short and will be over in minutes, you do not need to rush. It is easy to slip into natural driving when you know you are on an extremely safe course and do not need to check for people/obstacles/bikes/crazy drivers, but keep alert. 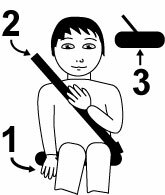 Remember that you are demonstrating how to be a paranoid, careful driver even when your instinct tells you that you are on the safest road in Japan. Note Hand Placement on the Steering Wheel. Keep both hands on the wheel at 10 o'clock and 2 o'clock. Do not let your hand rest long on the gear shift or anywhere else. When you turn, do hand-over-hand. IMPORTANT: Do not turn your hand palm-upwards on the steering wheel. It will count against you. "IT MIGHT NOT BE RELEVANT, BUT I PASSED THE TEST THE ONE TIME I SAID "YOROSHIKU ONEGAI SHIMASU" BEFORE I BEGAN." "IT MAY FEEL SILLY TO LOOK FOR STRAY CATS OR PLAYING CHILDREN ON A CLOSED COURSE, BUT JUST DO IT. I FAILED ONCE BECAUSE I DIDN'T BEND DOWN LOW ENOUGH WHEN CHECKING." Adjust your seat, even if it doesn't need it. Put on your seat belt; make sure there are no twists. Put your hand on the rear-view mirror, adjust if needed, and double-check the side mirrors. "I WAS SO BUSY LOOKING AROUND THE CAR, DEMONSTRATING HOW GOOD I WAS AT GETTING TO KNOW THE CAR BEFORE I DROVE IT, THAT I ACTUALLY FORGOT TO PUT ON MY SEATBELT. I FAILED. REMEMBER THE IMPORTANT STUFF OVER THE DETAILS." Before you move the car, do the "full head spin"
Most people know to drive on the left side in Japan, but it is not always obvious which lanes constitute the "left side" on the course. Study the course beforehand to determine which lanes are legal. The lines - sometimes solid, sometimes dashed, sometimes white, sometimes yellow - rarely help clarify except that you should never cross a solid yellow line. The course looks nothing like typical Japanese streets. In general, there will be multiple lanes along the outside loop and just a singular lane on the inside loop. The road through the middle may be a double-lane. Not only stay in the left lane but stay on the left side of the left lane, even if there is no center line. The rule, especially when making a turn, is 70 cm from the left - about the distance from your knees to your toes - but I've never heard of anyone failing for driving too far left unless they slid against the curb. It may feel like you are driving in the gutter; your right wheel will practically be in the center of the lane. The only time you don't stay to the left side is when you are making a right turn. 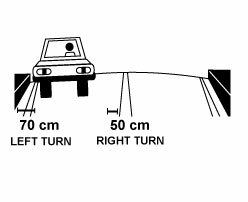 In that case, go to on the right side of the lane within 50cm (but be careful of the line!) Do not drive in the obvious, safe place: the center of the lane. "MAINLY I FAILED FOR NOT STAYING LEFT ENOUGH." When you slow down or stop, always pump your brakes instead of pressing down on them once. This is especially important right before you enter a curve. The proctor will think you are going too fast in the curve, no matter what your speed, if you don't pump your brakes several times beforehand. Don't worry about a smooth ride, instead be dramatic and obvious. Speeding up and braking hard is preferable to easing off the gas and gently braking. The rule is to signal 30 meters before the turn. I say, signal as soon as you come out of the previous turn. For the majority of the course, your turn signal should be on. Even if there are other turns ahead of your target, still put your signal on. (The logic is that a person behind you will know it is not the earlier turns because you would have had your signal on even earlier for those.) Your turn signal might pop off a lot, especially in the S-curve. Put it immediately back on. When you are coming out of the Crank or the S-curve (see more below) remember to signal. The proctor will probably tell you to turn, but sometimes, when you are concentrating hard on getting through the narrow section, you forget to signal. Look in your passenger side mirror. Looking over your shoulder and taking your eyes off the front will feel strange and often unsafe, but you must do it. The theory is that a bicycle or scooter could have caught up with you while you were slowing down to make the turn and be riding along invisibly on your left. 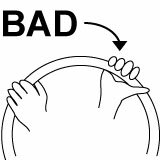 Before turning the wheel, you must look entirely over your left shoulder, not just check your mirror, swiveling your head at least 90 degrees. Look in your driver's side mirror. CHANGING LANES When you change lanes, ALWAYS signal and look over your shoulder before turning the wheel. Also, if you are changing lanes twice in a row, doing each one distinctly is wise. "THE PROCTOR SAID I DID EVERYTHING PERFECT EXCEPT THAT I FORGOT TO CHECK OVER MY LEFT SHOULDER ONCE OUT OF 12 TIMES. I FAILED." This is a fairly common rule in many countries, but just to reiterate: At every stop sign or blinking red light (the equivalent of a stop sign), you must be fully stopped behind the line for a solid three seconds before proceeding. Count to three slowly in your head before moving forward. What's the S-curve? The S-curve is exactly that, a narrow curve shaped like an "S." Start slow and drive careful and intuitive, staying as close as you comfortably can to the right side (the side you can see better). Do not forget to signal when you are most of the way through (your signal will probably pop out about three times, keep re-signaling.) It's not as hard as the crank. What's the crank? The crank is a very narrow section of road. (The proctor may sound like he is calling it the "clank") This crank is a road with two sharp right-angle turns, shaped like a square 'S' or '5'. It is wide enough for the car, but you must get through without driving over the curb or hitting the vertical poles. You may, however, reverse up to three times and you may run up against the curb as long as you don't drive over it. The objective is to try not to have your back rear tire clip the curb. Take it very, very slow [1st gear with clutch in most of the time] and enter it from a stop. Move left and try to stay left as far as possible before turning the wheel right. Take it on instinct. Try to sense where the edges of the car are and be prepared to hit a curb at any moment. If you have to reverse, don't try to turn the wheel too much, go straight back to where you came. If you do have to reverse, be very sure to turn and look behind you before you do. The crank takes a lot of concentration and it is easy to forget the simple things like checking behind. In both the S-curve and the crank, be especially careful if you have to make a left turn out - it is easy to clip your rear tire. "WHEN I WENT TO DRIVING SCHOOL, IT WAS NOT UNTIL MY FIFTH OR SO TIME THROUGH THE CRANK THAT I HIT THE CURB. DON'T GET OVERCONFIDENT. TAKE IT SLOW." Move car into right lane to go around obstacle. Your signal is on the whole time. Don't forget that, if there is a left turn right after this obstacle, check over your left shoulder again, no matter how redundant it might seem. 3. Other Cars There will be very few other cars on the course at the same time as you, but when you do come across them, give them wide berth. It is better to wait a long time for a car in the distance then to turn in front of them. Note: Be aware that you may share the course with freight trucks and motorcycle drivers taking their tests. Do not be alarmed. 4. Railroad Tracks Not all prefectures have this as part of the test. Know where the tracks are since from a distance they look like two funny bumps randomly on a road in the middle of the course. The thin pole may not look like the railroad crossings you are used to. You must stop completely, look both ways very obviously and then ROLL DOWN THE WINDOW to listen for a train. Yes. As silly as it may feel on fake railroad bumps, roll down the window and listen for a 'train' before proceeding. 5. Construction Zones Two words: GO SLOW. Lean forward and look around every obstructed view. Act extremely alert and cautious. "I SAW A METAL BOX PROPPED UP NEXT TO THE CROSSWALK. I PEEKED INSIDE AND SAW A SOCCER BALL. THE BOX HAD A RECEIVING ANTENNAE AT THE TOP AS IF IT COULD BE REMOTE CONTROLLED. THEN I REALIZED: THE PROCTOR COULD MAKE THE BALL ROLL RIGHT OUT ONTO THE CROSSWALK DURING THE TEST! WATCH OUT FOR THAT." Love Your Mirrors Always keep an eye on your mirrors, especially before a turn or a lane change. Look in your rear-view mirror before you brake. No Swerving Make clean turns. Do not swerve left before turning right and vice versa. Make Wide Right Turns Although you should take left turns as tight as possible, take right turns rather wide, especially when you are turning onto a double-lane street. Sometimes this means you are driving straight forward a little ways before turning right. That is okay. Make it as near a right angle as possible. Also, it is often preferable, to turn into the FAR LEFT lane when turning right, not the closest lane, the right lane. Avoid the Triangle! You will often see a small triangle or diamond painted on the ground at turns. They are turning guides. Aim for them but DO NOT drive over them. This holds true for pretty much any solid line. If there is a little arrow next to it, try to put your wheel on that. Speed On the course, there is usually a long, straight area where the proctor will want you to go 35, 40, or even 50kph on some courses [up to third, possibly fourth gear]. Usually, the proctor will tell you where, but not always. Generally, if you are along the outside of the course and do not have a turn for awhile, speed up. People have failed for not going fast enough. The proctor wants to know that you can control the car at high speeds. However, once you have reached the speed limit or the speed the proctor has indicated, slow down again immediately. More people have failed for not going slow enough. Downshifting Manual drivers: brake before/while you downshift. Obstructed Views Sometimes you will pass an intersection with high walls on one or both sides. Two words: GO SLOW. 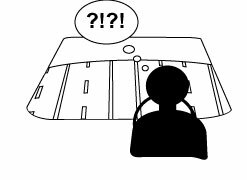 Approach the intersection very carefully, leaning forward toward your windshield as you go to check that the hidden view is clear. In real life, this kind of turn would have a mirror. The test site likely won't. "Slow" Signs (or marks painted on the road indicating the same) You do not need to fully stop. Treat these as a rolling stop, like it is a "Give Way" or "Yield" sign. Proceed carefully, looking around, hitting the brakes at least once. Curves Take curves very slow, about 15-20kph. Pump your brakes repeatedly before entering a curve [downshift into second], but do not pump your brakes inside the curve. Try not to give it any gas inside the curve unless you have to. Speed Limits Unfortunately, the speed limit signs on the course are very small and not typical of signs on real roads. Look for them when you walk the course. In general, along the outer loop will be from 35-45 and the inner loop will be 25-30, sometimes 15 around turns. If in the inner loop or on the inside roads of the course, it is wise to stay under 25 [second gear]. "I KNEW THERE WAS AN OBSTRUCTED VIEW. I COULDN'T MISS IT - IT WAS A GIANT WALL. ON MY FIRST GO BY IT, I WENT VERY, VERY SLOW. I CAME BY IT AGAIN TOWARD THE END OF THE COURSE FROM A DIFFERENT DIRECTION, CONFIDENT AT THAT POINT THAT I HAD DONE THE COURSE PERFECTLY. I DROVE RIGHT PAST IT. THAT WAS THE REASON I FAILED." The proctor will usually say the number of the spot he wants you to pull up at. It should be the same place, or very close to the place, you started. Pull forward until your front bumper is exactly in line with the striped pole. You can fail for pulling up too far or not far enough. Also, be careful not to hit the curb. Turn off the car, leaving the key in the ignition. Wait for the proctor to give you further instructions. He may tell others in the car to leave before he tells you your mistakes. He may ask you to move into the back seat for the next driver. He may tell you to wait outside or in the building. Always be polite and try to say "arigato gozaimasu"
"I PULLED UP TOO FAR FORWARD, WELL PAST THE POLE, AND THAT'S WHY I FAILED. HE NEVER EVEN TOLD ME WHERE I WAS SUPPOSED TO PULL UP AND DIDN'T LET ME TRY AGAIN." Not stopping the full three seconds at stop signs and blinking red lights. Forgetting to look over your shoulder. Forgetting your turn signal or signaling too late. Going over a triangle or a line when turning. Making left turns too wide. If you make a mistake, you usually may still continue unless they tell you otherwise. Oddly, if you miss a turn on the course, it does not necessarily mean you fail. As long as you keep driving correctly and get back on the course to perform all the requirements, you may still pass. The advice above is a conglomeration of information from different prefectures. To find out about your own prefecture's test, ask your supervisor, ask other JETs, check the internet, do as much research as you possibly can. Try to practice in your own car (if you can) to make some of the important tricks habitual and to lose bad habits. Expect that the first time you will be turned away or fail. It will be the hardest on your nerves. The second time will be easier. There are a lot of conspiracy theories about why it takes foreigners so long to pass. Some say that you will never pass your first (or second or fifth) try no matter what. Some say that it is all up to the proctor - either you get a nice one or you don't. Some say that all depends on timing - you will only pass on a day when it is relatively empty and the staff do not have anything better to do and therefore you should go off-season (instead of early-mid summer like most of us). These all may be true at some centers / for some proctors, but keep in mind that these are certainly not exclusively true and that the test is difficult for the Japanese as well. According to a survey of JETs in Japan in 2004 (including 85 respondents from 23 prefectures) the average number of times one must take the practical test before passing is approximately 2.4 times. Approximately 35% of respondents passed their first time. Of those who left advice, almost 15% recommended that you be polite, speak as much Japanese as possible, have a positive attitude, or feel out your proctor before proceeding. Nearly 40% recommended taking one to three lessons at a driving school or doing a practice course (on the actual site or elsewhere) with a Japanese person you know (friend / supervisor / contact) who can point out mistakes.